We spent Saturday flying--PDX to ATL to San Jose, Costa Rica--all day in transit. Early this morning--Sunday-- we loaded up and headed to Sarchi. Signage is one of Costa Rica's characteristics that seems to contribute to its laid-back and calm life style. Apparently, if you are looking for a particular place, a description is all you need, as addresses are rare. So, the restaurant was the next right turn after the big tree in front of the auto shop. These street signs are long past their prime, and may never have been useful. We saw lots of signs that were broken, faded, illegible, but, despite Quinton's concerns, we were never lost. Google maps worked and got us where we wanted to go. There is a Walmart in San Jose, we drove by it, so I know. More astonishing was the Starbucks in the middle of all that great coffee. I suspect it was for the tourists. 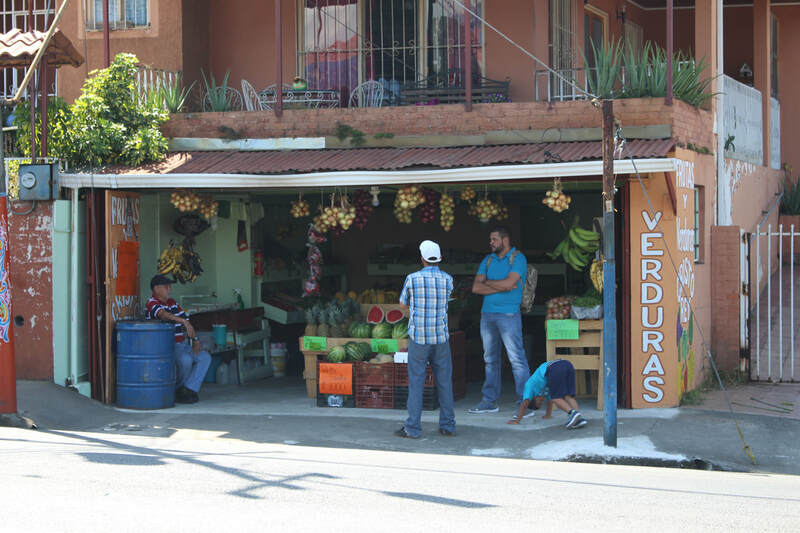 This small market in Sarchi was more representative of how the locals bought food. The fruit, especially pineapple, watermelon and mango were the best. You could even have a conversation with the shopkeeper, because you grew up with him.